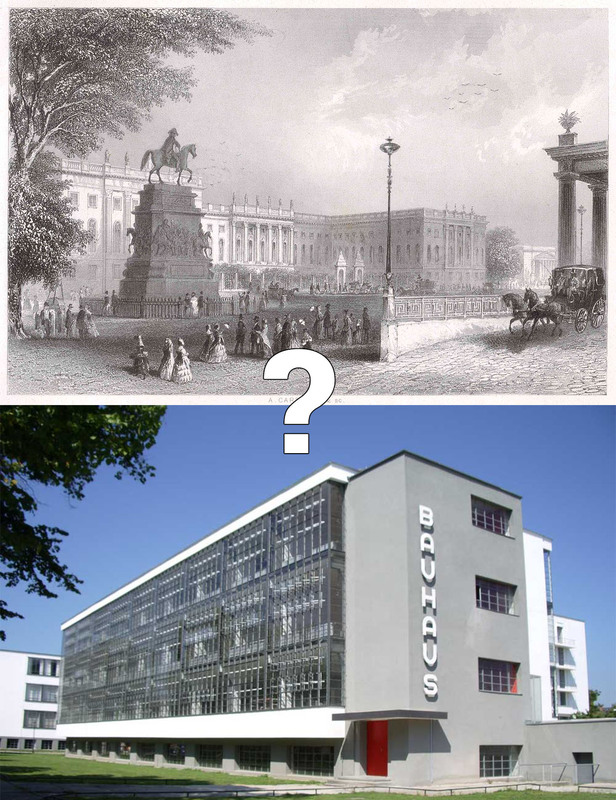 The University of Berlin, built in 1810 and The Bauhaus, Dessau, built in 1925. It’s 1780 and throughout your life, you’ve listened to your grandparents go on and on about how everyone has lost their faith — religion isn’t what it used to be. That’s because you’re living in the Age of Enlightenment and for the last century and a half or so, there has been a massive shift in the world. Great thinkers like Locke, Voltaire, Kant, and Newton have been publishing texts revealing information about the world that has been found through logic and reason, rather than religion and faith. This shift in thought has lead to a world of new technologies and the beginnings of the Industrial Revolution. In just the last 10 years, you’ve seen the invention of electric telegraphs, flushing toilets, steam ships, and bi-focal eyeglasses. The world is going crazy and it’s going their quickly! The influx of inventions means there are more goods for people to buy, which means more people are working in factories than ever before. Over the next couple of decades, workers who previously found abundant manual labor on farms must move into the cities to find work in the factories. During the early to mid 1800s, people crowd into the cities looking for work but infrastructure can’t keep up with the massive inflow of people from the country. 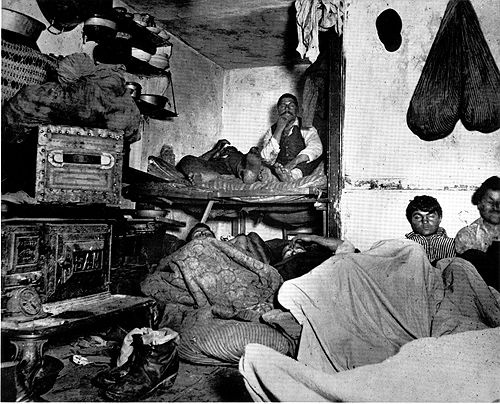 It’s not unusual for families to sleep 7-12 people to a room in tenement housing without sunlight or adequate ventilation. These same families live just down the hallway from where butchers, tanners, and merchants conduct their business since there is nowhere else to go. Disease and crime run rampant. Parts of London, Berlin, and other major cities are hellish landscapes driven by factory jobs and the inability to adequately house this new metropolitan way of living. Luckily, the horrors of tenement slums were eventually revealed to a broader audience of upper and middle class citizens through investigative journalism and activists and change started to take place via new policies and architectural innovations. Throughout the mid 1800s and 1900s, architects and planners struggled with the question of how do we design cities and their buildings for this new urban, industrial lifestyle and how can we use these new technologies and materials? As you can see in the diagram above, a myriad of styles and movements were born, all attempting to answer these questions. Each style learning from or reacting to the others. The Arts and Crafts movement rejected mass production and promoted skill-based handicrafts. Art Nouveau embraced new technologies such as concrete and float glass but maintained an affinity for decoration. The Futurists wholeheartedly embraced the speed and power of modern technology, while Beaux-Arts architects fought to revive the great architectural traditions of the past. 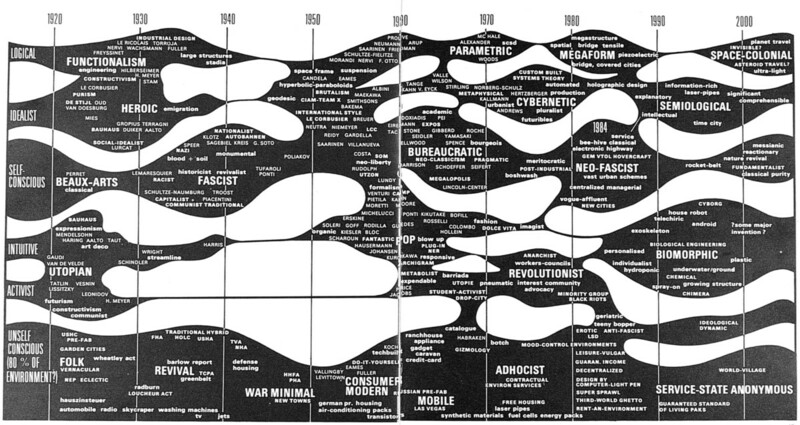 Remarkably, ALL of these styles were major influences or participants in the the overarching movement of Modernism. The International Style however, cropping up in the 1920s and 30s, rose to the top of the pile and spread across the globe like wildfire. 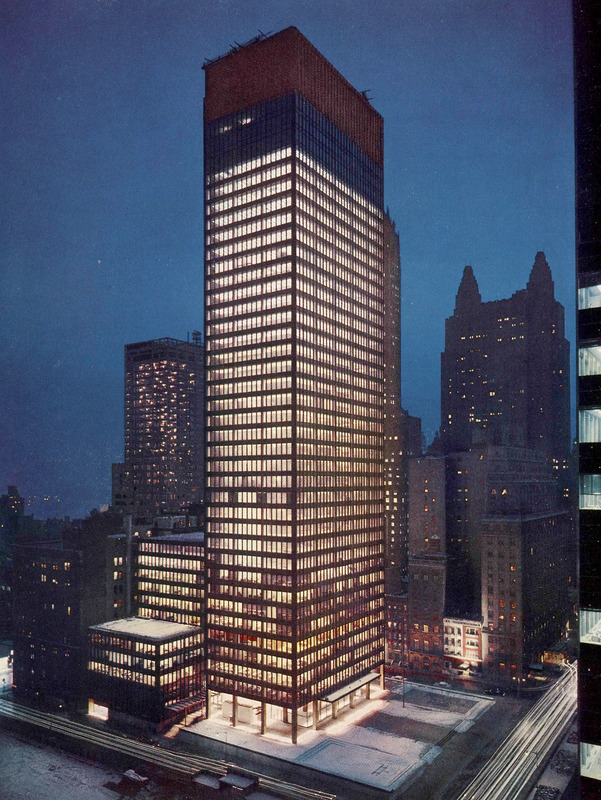 Characterized by expansive glass windows, concrete or steel structures, and rectilinear forms, buildings in the International Style took advantage of the latest technologies to bring vast amounts of daylight, high density space, and an aesthetic that was unique to modern people of the early twentieth century. In nearly any major city, you can see the influence of the International Style in the ubiquitous tall, glassy, boxy highrises. Until the rise of Post-Modernism in the 60s, the International Style reigned supreme as the style that best represented a modern mankind.